Point out the catastrophic undermine of the ban of force in the UN-Charter, which goes along with the behaviour and the preventive argumentation of the nations , who started a war against Iraq in March 2003, contrary to the overwhelming majority of the nations and without any mandate of the Security Council. Give everyone the opportunity to make his contribution to the manifestation of our world’s people’s will for the solution of international conflicts without the means of force and war. 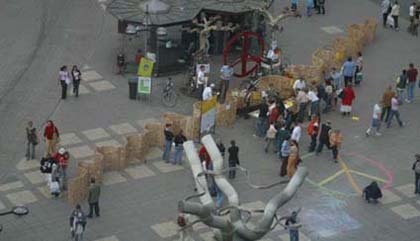 As reaction to the invitation from the Mayors for Peace - and in deep respect to their engagement -, while the last year before the 60th anniversary of the atomic bomb dropping on Hiroshima and Nagasaki at August 6th 2005, to give everyone at the same time the opportunity to manifest with his contribution to the growing memorial his will for an immediate starting of concrete steps for the implementation of the duty, according to International Law, to the abolition of all nuclear weapons. 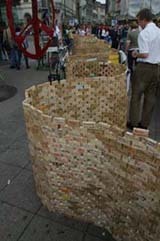 Every brick represents one person, demonstrating in a highly visible way the declared intention, that no nation can support the Charter Of the United Nations without supporting the renunciation of violence enshrined in it. 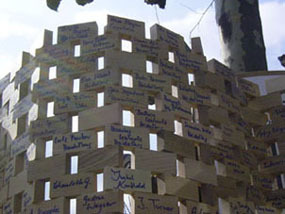 Use YOUR VOICE to build a symbolic protective wall for International Law and sign our open-letter. The latest update of the list of signatories will be available for everybody on this website. The list of signatories, i.e. a memo containing the link to the updated list on this website available via the internet shall be submitted to all ambassadors to the UN in New York. 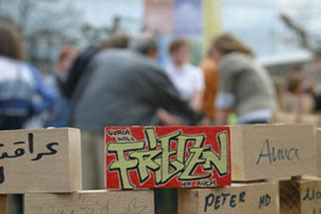 Help us with YOUR BRICK to turn this protective wall into a Growing-Peoples-Memorial-for-International-Law that can not be ignored.